For over forty years, AT have been making quality home linen, kitchen napery and accessories loved by people Australia wide. Their Australian-designed products are made with care and will look wonderful in your home – whether you want to stay groovy and splatter-free while you cook, or you want to look good when you’re drying the dishes! If you love food, chances are you love its best friend…wine. Red or white, vintage or fresh from the bottle ‘o, wine is the life-force behind many a merry meal, whether it be a key ingredient or in a glass thoroughly enjoyed during the cooking process. 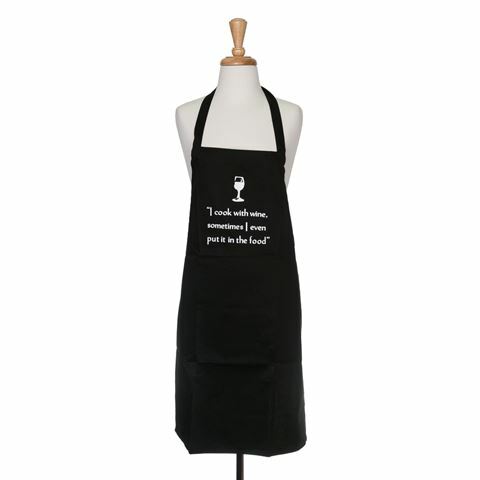 This tough cotton apron has been screen-printed with this very reasoning – “I cook with wine, sometimes I even put it in the food” – and is perfect for the mischievous wine-loving chef of the home. Dimensions: 85cm (l) x 61cm (w).